Topple 2, the $3 sequel to Ngmoco’s hugely popular iPhone game, creatively builds on the breakneck-paced cartoony fun of the original. 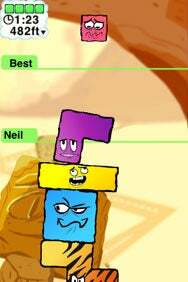 Can You Top That: Among the new options introduced in Topple 2 is a multiplayer mode where you try to out-stack your opponent’s tallest tower. Where Topple 2 really shines over the original is in the addition of well-executed new modes and extra gameplay options. In addition to the original main gameplay mechanism—stacking shapes to make towers—there are a variety of new modes you’ll encounter. In upside-down mode, gravity’s been flipped, and your stack starts from the top. On one level, you build your tower underneath an egg, and then must gently remove shapes to bring the egg back down to the bottom without letting it (or your tower) fall. Another mode forces you to balance shapes on two sides of a scale. As soon as I mastered one level type, Topple 2 threw another in my face, which strikes me as perfect game design. Topple 2 also improves upon its predecessor by introducing a multiplayer feature, with as smart an implementation as I’ve seen on the iPhone. You can certainly play against your pals via Wi-Fi if they’re around, but I literally never find myself gaming on the iPhone with friends. Apparently I’m not alone, as Topple 2 features a slick “Challenge” mode to compete against your friends with a little delayed gratification. You stack a tower as high as you can within the time limit, and then the game can fire off an e-mail to your buddy with a special link so that they can compare their game to yours. This isn’t just some high score comparison, though. An animated line shows you how tall your challenger’s tower was, as you play, to heighten the competition. It works wonderfully. Unfortunately, the competition seems a bit imperfect; I’d prefer that I see exactly the same pieces, in the same order, that my friend saw when he challenged me. Instead, the pieces are random each time. Still, it’s a fun way to play. Like the original, Topple 2 features excellent visuals. The shapes you stack are delightfully drawn, colorful, and full of personality. When they feel stable, the shapes look happy and content. Over time, your tower inevitably grows wobbly with poorly placed pieces, and the shapes’ faces show the same angst you start to feel. It’s great. Backgrounds and level maps look simply gorgeous. The game also includes a pleasant (though somewhat repetitive) soundtrack, with a slightly retro mood. Sound effects are adequate. I found rotating pieces kludgy. That may be by design, but I longed for pieces to spin to my desired orientation a little more easily. I really appreciate Topple 2’s “unlimited lives” mentality. I’m comfortable admitting that I got stuck for a while on Level 3 (damn you, z-shaped pieces! ), and I remain grateful that I could keep retrying until I got it down. With great art, new modes, multiplayer options, and genuinely fun gameplay, Topple 2 is a worthy sequel to the first version and an easy game to recommend. Topple 2 is compatible with any iPhone or iPod touch running the iPhone 2.2 software update.